Tsurumi's dehydrators feature unitized construction that integrates all necessary accessories, and can be more easily installed and are very compact compared with belt presses and centrifugal dehydrators. The dehydrators boast lower noise, reduced energy consumption, and require less water for flushing, thus providing an economical and eco-friendly solution to dehydration applications. 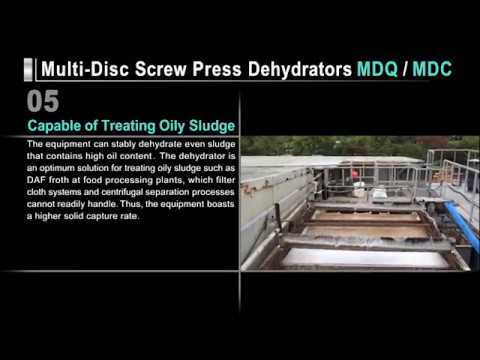 Multi-disc screw press dehydrators utilize both gravity filtration and screw displacement compression systems. 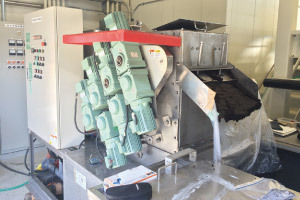 The pitches of the screw blades are gradually narrower toward the cake outlet in order to reduce the volume of cake, so the coagulated sludge that has been concentrated by gravity filtration is dehydrated by compression. 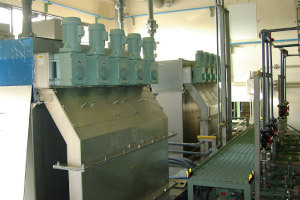 The dehydrator main unit requires lower motor output and the filtration surface consists of a multiplicity of self-cleaning capable discs, and seldom clogs. Thus, the dehydrator can be used continuously. 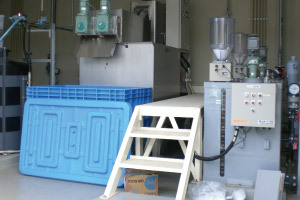 The main unit of the dehydrator is of multi-shaft design. Therefore, when two or more main units are configured into one machine, any individual shaft can be repaired or serviced without interrupting dehydration operations. 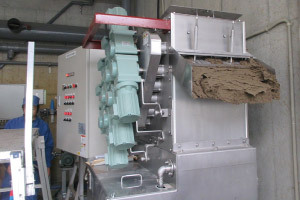 Multi-disc screw press dehydrators can cope with a wide range of sludge concentrations, and also stably dehydrate sludge that contains high oil content. 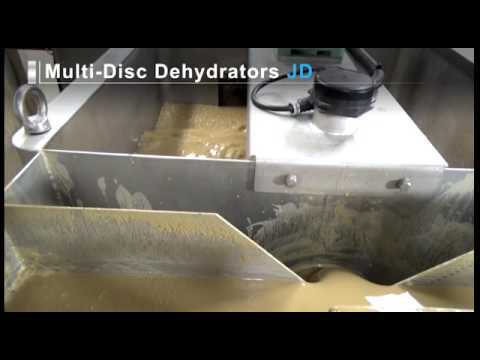 Multi-disc dehydrators utilize both gravity filtration and compression dehydration systems. The "filtering rollers" consist of alternating thin metal discs and resin discs, and are arranged in two (upper and lower) tiers. 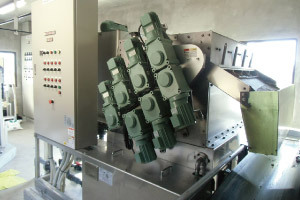 The coagulated sludge is fed between the rollers and dehydrated by compression while being conveyed toward the sludge outlet by the rotating action of the rollers. The dehydrator main unit requires lower motor output and the filtration surface consists of a ultiplicity of self-cleaning capable discs, and never clogs. Thus, the dehydrator can be used continuously. 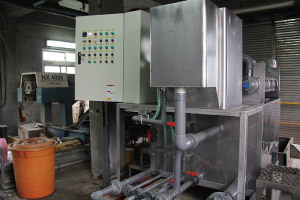 Multi-disc dehydrators can cope with a wide range of sludge concentrations, and also stably dehydrate sludge that contains high oil content or organic sludge that contains high quantities of inorganic substances.